Recent release “Just Another Day” from Page Publishing author V. Annie Geiger is the whimsical tale of a young mole longing for adventure, but when it presents itself he realizes the importance of friendship and community. 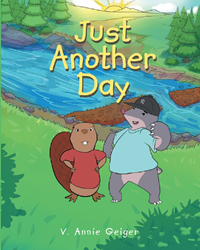 V. Annie Geiger, a well-traveled grandmother of 3, has completed her new book “Just Another Day”: a delightful and sweet story of a young mole looking for adventure and excitement, and rising to the challenge to save the day when given the chance. Published by New York City-based Page Publishing, V. Annie Geiger’s winsome tale introduces young readers to Joshua Mole from Moletown. Joshua loves to live in the world of his own dreams and adventures fueled by his love of books. Joshua longs for the day when something exciting happens. One day after school, Joshua’s mother tells him that they must leave their home because the dam above town is in danger of breaking. Joshua decided that he will do whatever it takes to save the day and goes to his friend Christopher Beaver’s house to ask for help. This vividly illustrated, endearing story proclaims the power of positive thinking and promotes good community, all while entertaining children of any age. Readers who wish to experience this captivating work can purchase “Just Another Day” at bookstores everywhere, or online at the Apple iTunes store, Amazon, Google Play or Barnes and Noble.